For reasons unknown, I have always had this strange fascination with India. Has it got something to do with the colourful sarees and Holi festivities? Is it the vastness of the land that appeals to my love for space, or the magnitude of its population which is just beyond my comprehension? Or maybe it is the strides they have managed to make in medical innovation with little resources? 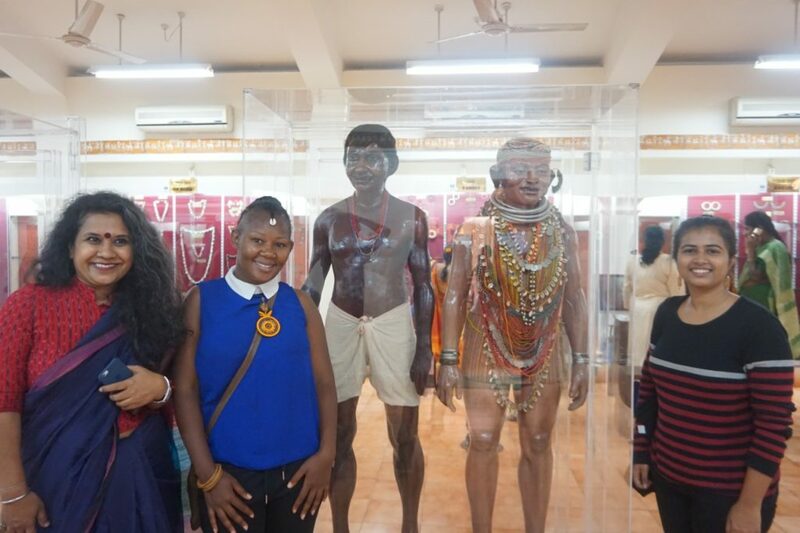 Maybe it is the charm and larger than life personality that my friends with Indian heritage like Aleya and Deepa have, that makes me think the country must have it in abundance as well. So, when in August last year Deepa Kiran emailed saying, “…nothing is certain as yet (but) just let me know your interest and availability …” the look on my face must have reflected one of those emojis that I can’t quite figure out. I had met Deepa in Iran at the KANOON FESTIVAL in 2016 and we had immediately clicked, promising to hunt for opportunities to share a stage again. And that was to be in early December 2018. If you have ever been at the back end of organizing events, then you know the challenges that creep, sprint or do a marathon on you. 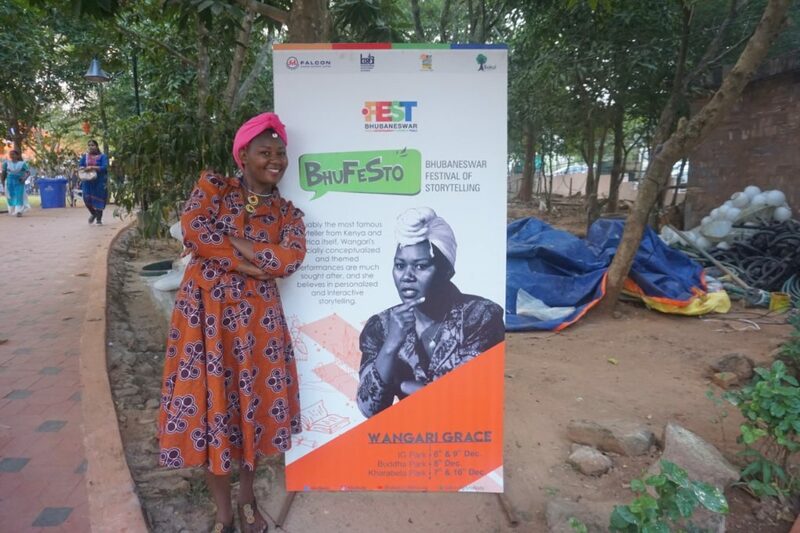 Now, Bhubaneswar Festival of Storytelling (Bhufesto) had a series of triple-chase hitches that ended up with me receiving my flight tickets only three days before I was due for travel – and four days to the festival! On a Friday evening. 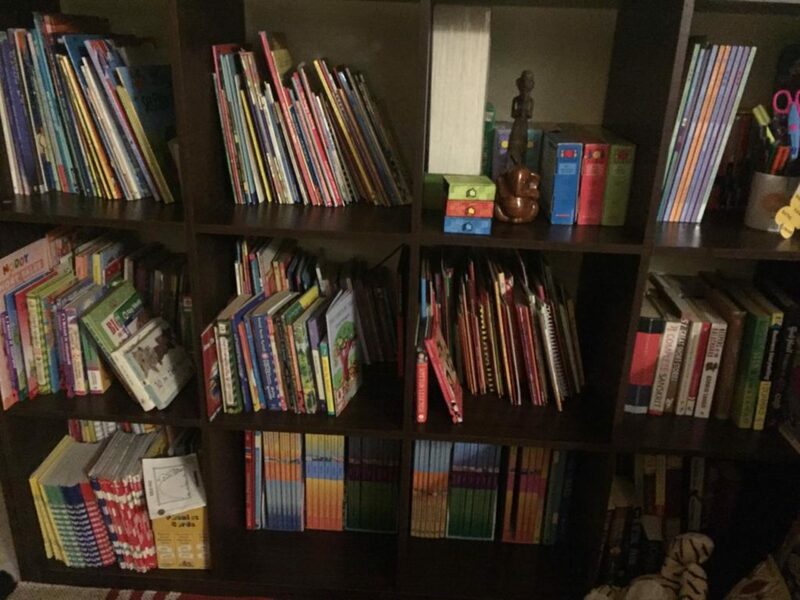 In the ideal world, I would just need to pack my bags with smashing outfits and enchanting stories, a few copies of my children’s books, an open mind, a smile, and some space for adventure before heading to the airport. Then, the ground crew at Delhi would greet me with a warm smile or a hug and Namaste, right? I could choose to hop on a witches’ broom, grab Alladin’s lamp and rub a wish for myself, or even steal his magic carpet and parachute myself to Bhubaneswar. But that only works in stories. I knew outright that there was no way I would be able to get a visa through the kawaida channel in that short period. Google, being Ms. Know It All, told me it is actually possible to apply online and get a visa on arrival. After filling loads of info (including whether I have any Pakistani ancestry), payment via card fails. It was Saturday and here I was forced to go back to square one. I tried again on Sunday with same results, the only option being applying through regular channels and pleading my case should I get a physical appointment. The earliest appointment I could get was two days after the festival has ended. The allure of walking the streets where, according to Bollywood, everyone is a danseur magnifique to soulful tunes motivates me to call the embassy on Monday morning. No, the consular section does not receive calls in the morning hours. No, they do not give emergency visas unless it is a medical case, and as if the lady on the other side thought I might fake one, you must give evidence from a doctor. Let me give you an address to send an email with your request. You had already sent one, you say? Just send another one. No, there is no direct line to the department; you have to go via switchboard. I had tried, I consoled myself as the smell of all the hot curry I would not eat disappeared from my nostrils. There will be another time. There is always another time. Monday night, Mohit calls me. He is this guy that I did not even know I did not know. He is a storyteller and Yoga teacher in Hyderabad who was to feature at Bhufesto. No, you are not allowed to give up. You need to go to the embassy in person and plead your case. Dude, are you serious? Just show up at the embassy, huh? Listen here, you need to be a bit crazy. Indians love a bit of drama so go give it to them. So, with only the exhortation that “I am sure you are crazier than you are letting on”, I head to the Indian High Commission on Tuesday morning. The organizing teams in Bhubaneswar and Hyderabad had also been on top of their game – countering every stab thrown at me like pros. You need to have revised flight tickets? On it! A letter from the Indian government okaying the event? Check mail. I got to Bhubaneswar at 9:30 am, a day after the festival began. After a quick check in at the hotel and grabbing a bite, it was off to the park for a 4-hour storytelling session with a break in between. And boy, was it worth every hassle! The audiences were simply amazing, with some coming in for the first session at 2:30pm and staying until 7:30 in the evening – soaking into the stories, laughing, singing along and trying the steps. At each single event, there was a minimum of 500 people every evening, running along the story-journeys that the storytellers took them along. I did not get to see much Paula Martin (Argentina) Dr. Wajuppa Tossa (Thailand) and Puppeteer Sabrina Arusam (France) but I knew we would be together later in Hyderabad. I caught some good times both on and off the stage with talented Indian tellers like Lopamundra Mohanty, Prachitara, Mohit Garg, the charming author Ramendra Kumar, and the youthful Vividha Vyas. There were several other performers as well that I was not able to watch due to program parallels. 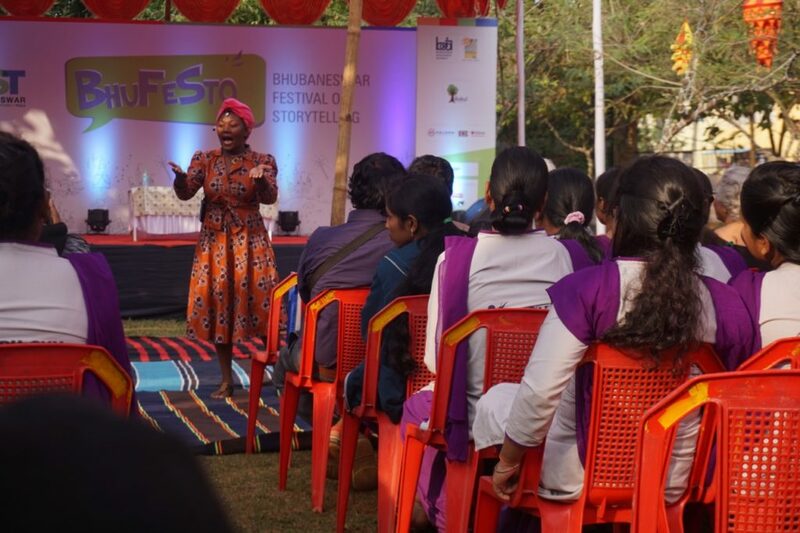 Organized by Bakul Foundation in partnership with the state government, Bhubaneswar Festival of Storytelling was running on the fringes of the Men’s Hockey World Cup games held in Orissa State. The city’s theme for the season was FEST – Food, Entertainment, Stories, Trails. Two other major events were running at the same time: a music festival and a food festival. Every afternoon, three storytelling events would run concurrently in three different parks around the city. 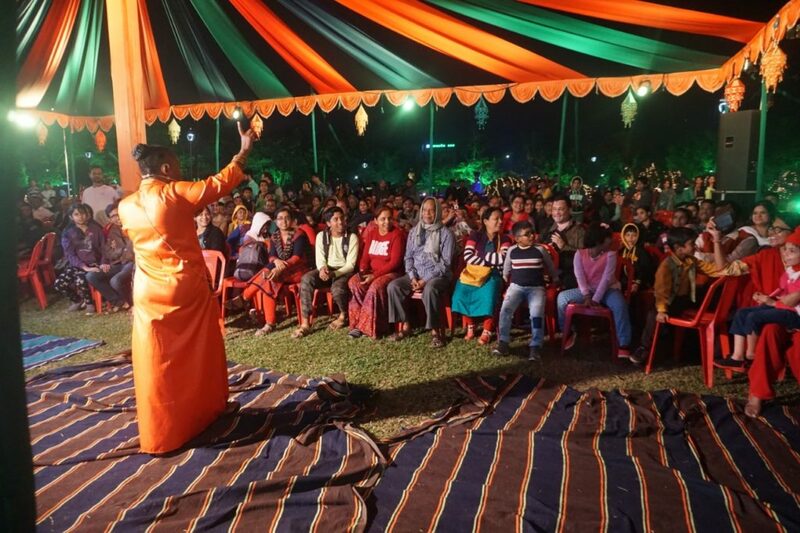 Storytellers would shuttle between Indira Gandhi, Budha and Kharabela parks to answer to the call of the program. And some audience members too as I came to discover. 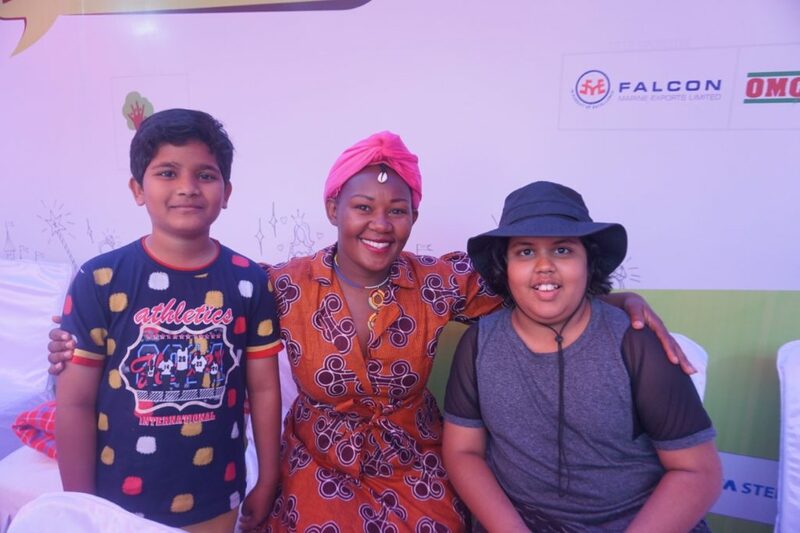 It was extra fulfilling, the parks coming to life with all these eager story lovers spanning generations – grandparents, their children and grandchildren answering to the call of stories. The festival organizing team at Bakul led by Sujit and amazing volunteers transformed the hassle that comes with such intensive programming with their impressive coordination skills that the fatigue only leapt at you when you lay your bones to bed. Coming from a country where culture, sports and the arts falls under the same docket yet we never take advantage of all the games and athletic events we host to show off our diverse art and culture, this arrangement blew my mind away. This was the inaugural event, I believe subsequent editions of the festival will be nothing short of amazing. In between, an invitation came to go and share stories at Centurion University. This was not part of the official festival program. 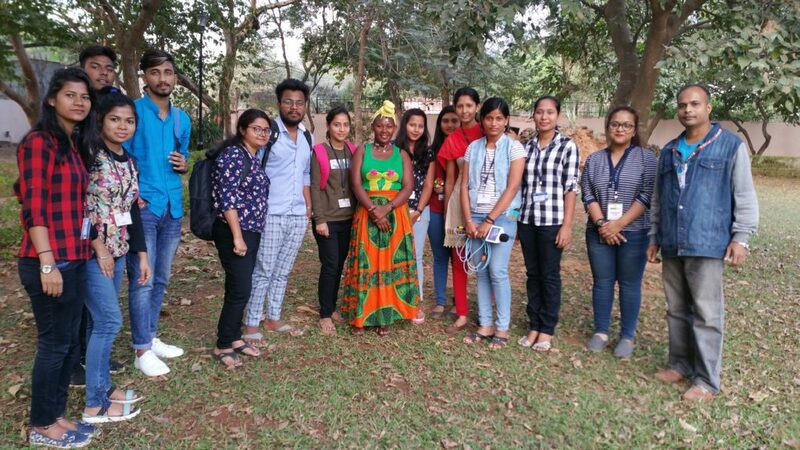 The school had sent some of their Media and Communication students to cover one of the sessions, and after an interview with them, they extended the invitation to tell to their Institute of Knowledge Societies students within their campus. I had loads of fun sharing tales with circa 200 students and faculty members. Thank you Mr. Sarat! After 4 days fun, it was a wrap for Bhufesto. Mohit, Deepa, Wajuppa, Paula and I headed to Hyderabad for two days. 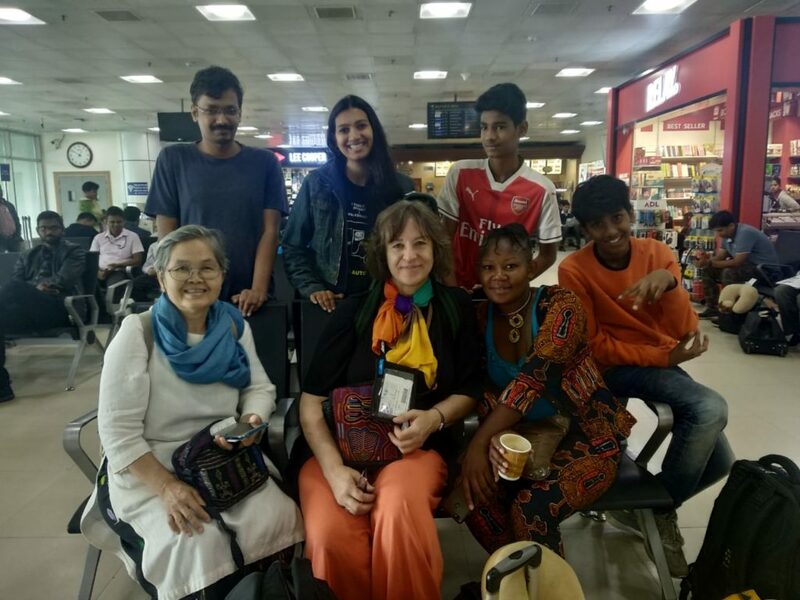 The Hyderabad visit was diligently facilitated by Deepa Kiran and her Story Arts India team. She is indeed a wonder woman – curating two different events in two different cities is no joke. I was also happy to share a stage with her and the other three amazing tellers whom I had not gotten a chance to sample in Bhubaneswar. 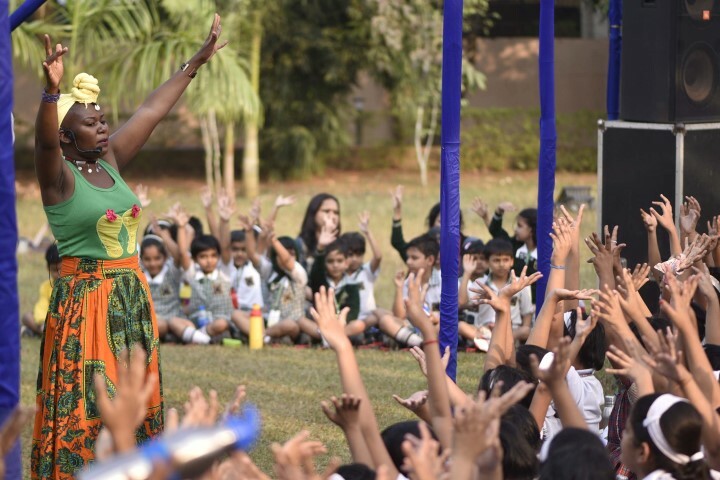 In a whirlwind, we juggled a performance in a school, at a public space and a teacher’s workshop, and a dozen media interviews. Deepa and her team even managed to fit in time to take us shopping. Such love! All too soon, I was on the plane back to Nairobi right into the arms of another festival.